Welcome to Arcane Radio, presented by Darker Days Network. 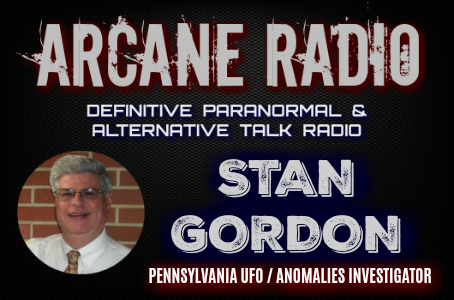 This week, our friend & colleague, Pennsylvania UFO / anomalies investigator Stan Gordon joins us on Arcane Radio. Stan has been the leading authority on anomalous activity in the Keystone State for the past 50 years. Since the late 1960’s, Stan has lectured to the public on the UFO subject, as well as appearing on numerous radio shows and TV productions. He has written three 'casebooks', including his most recent 'Astonishing Encounters.' We'll surely have a lot to discuss. Don't miss this interesting show! Join us on Thursday September 28th - 10PM-12MID ET - go to www.arcaneradio.com and click the 'LISTEN' tab, then click the Arcane Radio arrow. The chat room is there as well...sign-up and be a part of the conversation! “I just want to say, I'm 70 years old. I had an experience when I was 40. I came home one evening...it was in the dead of winter in 1984. This occurred in Bonner Springs, Kansas, a small town west of Kansas City, Kansas. We had snow on the ground for quite some time. It was bitter cold like around 0. My son was 16. He's a country boy. Him and his friend across the street had been out in the country and they were very excited because they found bear tracks. And I'm like, 'Oh really?' And the first thing I got was, older kids, snow and they made tracks. They wanted me to go and take them to see these tracks at 10 o'clock at night and it was bitter cold and I'm like, 'No. No.' Well, my son was so excited. He was just, 'Mom, you have to see. Mom, you have to see.' So I grabbed a little 35-mileometer camera, I had one picture left and I grabbed a big flashlight. Blood-chilling photos on a cell phone found by a construction worker have led to the capture of a suspected cannibal couple in Russia, who according to local media ate over two dozen people after committing murders over a period spanning 20 years. The allegations covered by various media outlets are nothing short of spine-chilling. According to initial reports, the couple, from Russia’s Krasnodar Region, has allegedly been involved in the gruesome practice since 1999. It was also said that the couple was in fact responsible for the deaths of up to 30 people. The couple reportedly manufactured canned human meat for their own stockpile and to feed to the servicemen in the nearby military school, where the woman worked as a nurse. Seven packs of body parts, 19 samples of human skin, and human remains pickled in jars were all found in the freezer and cellar of the Krasnodar house of horrors, according to Russian media reports.